In the fall of 1992, while attending a Friday Night prayer meeting with Fr. Leroy Smith at St. Joseph Church in Cold Spring, Kentucky (about 50 people were in attendance), it occurred to me, while singing Our Lady of Light prayer/song from a mimeographed sheet of paper, to possibly have a prayer card printed with the prayer/song for one’s purse or pocket. On returning home, I looked through funeral cards of family members and found a beautiful picture of Our Lady. Taking the mimeographed sheet from the prayer group and this funeral card, I went to a printing shop in Newport, Kentucky. The printing companies have supplies of many different cards in stock to accommodate the needs of the funeral homes. The printer had 500 copies of this colored picture of Our Lady which was blank on the back except for 1603 and made in Italy under a logo on the back bottom of the picture card. Upon request, the prayer/song Our Lady of Light was printed on the back of the 500 picture cards. These were given to Fr. Smith at the next Friday Night Prayer Group meeting to be passed out anonymously. Of the 500 printed, we kept 50 cards for our family and friends. A second printing of the cards (400) was requested some time in 1994 and they were given out to different people at different places. On January 31 and February 11, 1996, messages were given to the Batavia, Ohio visionary where Our Lady, “asked us (especially her special priests) to review her previous messages of May 9 and May 10, 1992 (see below) because they remind us of the reason she came here as Our Lady of Light in the first place. She also requested that a prayer card be made with her picture, as I saw her this evening, on the front of it and with Our Lady of Light Prayer on the back.” (See Message of January 31, 1996 below). In the message of February 11, 1996, Our Lady responds to the Batavia visionary with regard to the choosing of the card (also included below). Because of our involvement with a prayer card early in 1992, the messages of January 31 and February 11 were given to us to act upon according to Our Lady’s request. At this point in time, efforts were made to contact Bonella Fratilli (SRL), the company in Italy that prints the card, through a friend who was currently president of Thomas More College. He requested by letter (in Italian) permission to modify the image of the Blessed Mother by encircling her resemblance with a rainbow as she requested. This letter was sent at the end of February, 1996. After a three month wait, an answer came on May 14, 1996, denying the request and referring us to the Gerfett Company, Inc. of Long Island. Contacting the Gerfett Company, we found that they are a distribution center and that #1603 picture card is only printed 3 times a year in Italy. To work with them on this picture another three or four month wait would be necessary. Due to our inability to honor Our Lady’s request (to have her resemblance encircled on the #1603 picture from Italy) Our Lady informed the visionary of another choice through her message of June 6, 1996 (see message below). Our Lady refers here to another picture of a painting of Our Lady that was given to Fr. Smith and the Batavia visionary. However, the people involved in printing this thought it would be difficult to reduce it in size in order to accomplish a clear and concise image on so small a card. After this message was received, it was well into June 1996, and we knew that anything from Italy would not be sent back in time for distribution to the pilgrims on August 31st. It was decided after much prayer and with the help of those involved to design the so-called back of the card with Our Lady’s signature rainbow on it. This took some time, but the card was ready four days before August 31, 1996. 50,000 copies were printed at that time. The following messages refer to the request of Our Lady of January 31, 1996 and excerpts from the message of February 11, 1996 used on the bi-fold prayer card. 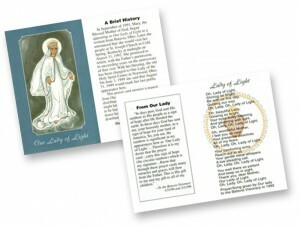 The printing of the prayer card after 8/31/96 included these messages, as well as the brief history of Our Lady of Light. I went to the field in Ohio this evening to keep the monthly midnight visit with Our Lady. A friend accompanied me on this occasion. As we approached the field, I heard an inner voice say “look up.” When I did, I could see a very large circle of light, or halo, surrounding a brilliant moon. I pointed this out to the friend with me and then we continued walking. As we prayed the rosary, I saw light form in the nearby trees and then Our Lady appeared in this light. She thanked us for coming there in answer to her call and for the sacrifice of our time on this very cold evening. She said that the circle of light around the moon was to show us that her circle of light and her circle of love still surrounded us and that she had not forgotten us. It was also representative that her mission here as Our Lady of Light had come full circle with the ending connecting to the beginning of it. She asked us (especially her special priests) to review her previous messages of May 9 and May 10, 1992, because they would remind us of the reason she came here as Our Lady of Light in the first place. She also requested that a prayer card be made with her picture, as I saw her this evening, on the front of it and with the Our Lady of Light prayer (the song) on the back. 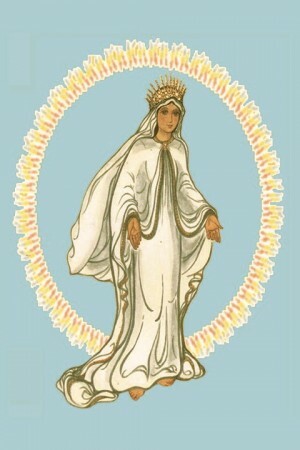 She wants these cards distributed over the land of America so that people will know she has come here and wishes to be known here as Our Lady of Light. Our Lady gave me many messages, and some were quite lengthy. I told her I would never remember all of them when I wrote them down, but she assured me that she would help me to remember, as she always does. I was given personal messages and others to be given to Fr. Smith, Fr. Rinfret, and Fr. Sweeney, her three ambassadors. She also sent personal messages for certain other individuals. Some of these I will relate in other texts. Shortly before Our Lady left, I saw another light beside her, and then I could see Jesus standing in this light. I heard Him say, “Come to me when you are weary and I will refresh you.” Then He just seemed to fade away. Our Lady was there for a short time, but it seemed to be a long time. She again showed me things that I was told not to comment on, but to pray about. She gave us a special blessing and then disappeared. This was another beautiful evening with Our Lady. Thank you, Holy Mother, for this gift and for your love. note: Incidentally, the next morning I heard on the news that they (the TV stations) had received many calls asking about the halo over the moon on this night. Coincidence? I think not. As Our Lady has often said, God has reasons and timing for everything, so I’m sure that this halo of light was God-sent and was Our Lady’s reminder to all of us, just as she said that her circle of love surrounds all of us and that this light was sent to tell us that she is still here with us and will always be with us, her children. Know that I have heard the words of your heart and that I thank you for asking my permission in the choosing of Our Lady of Light prayer card that I requested be made and distributed among my children everywhere. It is my desire that this be done swiftly, for the time is ever short and there are so many souls to reach. I tell you now that the prayer card already designed in earlier days will be acceptable to me. I give it my blessing. There is, however, one request I make, and that is, if it is possible, that the picture of my resemblance on this card be encircled with a rainbow which is my signature and also my approval. In days past God sent His rainbow to His people as a sign of hope after he had flooded the earth. In these days God has sent me, your heavenly Mother, as a sign of hope for your land of America. So, you see, the rainbow is significant in my appearances here as Our Lady of Light. Therefore it is my desire that the prayer card of Our Lady of Light carry this sign of hope on it. All should know that I carry each and every one of them in my heart and encircle them with my love and my light. The light I pour down on them is God’s graces and the love I offer them is my protection if they will open their hearts and accept it. Know that through these prayer cards many miracles and graces will flow from the Father. This is His gift to me and my gift to all of my children. All miraculous signs that have occurred and will continue to occur are simply the testimony of God’s love for His people. Even with the many miracles happening in these days, however, many still refuse to believe. Pray for these souls, that their hearts may open to God’s love for them. Know that it was also a gift of the Father when I appeared in a grotto similar to this one, to another messenger of mine in a distant land (Lourdes, France). This messenger (St. Bernadette) is now with me, on this side of the spiritual veil, and she continues to aid all on earth who call on her through her prayers for them to the Father. As this is the feast day commemorating the special event of my visit to Lourdes, I wish to thank you for honoring me with your visit to me here to honor my special feast day. I thank you also for bearing witness to my light, even when others carry doubt about my appearances and insult you with their words or their actions. Remember that the sorrow and pain you endure for my sake will earn many graces from the Father. Be at peace and rest in the knowledge that you are loved. I ask that you bring my other children to me, here or at my other apparition sites, and I will take their hand and lead them to Jesus. Stay ever humble of spirit and trust always in Jesus’ mercy. I am Our Lady of Light and your mother. Thank you for your response to my call. note: A response to the visionary question about her Prayer Card. I thank you for seeking my guiding words concerning the prayer card that I requested of Our Lady of Light. I have already given you my wishes, but will give my blessing and acceptance to whatever choice is made. The one already in print is acceptable to me, as I have already spoken. The other one is also acceptable. So either or both of these resemblances of me are now given my blessing and my approval. I ask, however, that my “signature” (circular rainbow) be added on these cards, on either front or back. As both of these pictures have my approval, so all concerned should be at peace. I remind you also that the final decision here I have already placed in the hands of my priestly son, Fr. Smith. I wish to thank those involved in this project for acting on this request of mine. Give to them my love and my blessing. On Saturday May 9, 1992, while at the Medjugorje Conference at Notre Dame University, I had this personal experience. I am recording it because Our Lady directed me and for my own record. The picture of Our Lady of Medjugorje that was on the curtain behind the stage appeared to come alive, and Our Lady related many messages to me, some personal and some for all. There was a “golden light” of an angel behind her and, when Mass started, the angel turned and knelt, facing the altar. Our Lady asks that September 1 be designated as Our Lady of Light (Day), the date of her first appearance as such (at the farm in Indiana). She wants all mothers to bring their children to her and to consecrate them to her. 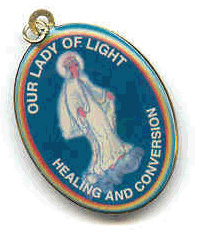 She wants the Our Lady of Light prayer that she gave to me delivered all over the United States. It is to be (part of) her first movement here as Our Lady of Light in this country. Our Lady was crying and it tore at my heart. She further asked me why I had not honored her request, as she needed my help. She again asked me to surrender my will to God so that she could use me in her work here in America. I had never seen Our Lady cry before. It was painful. I of course accepted. I will do whatever she directs. To continue, Our Lady would turn and open her eyes and raise her arms to all the people there. In looking at the people, she was crying. When I asked her why she was crying, she said it was for all the lost souls, especially here in America, that we all needed to pray for these lost souls, and that we should all offer up all of our suffering with Jesus, her Son, for their salvation. She said even our frustrations and disappointments would be a great offering. She said she desired that September 1 be a day of prayer. She said on September 1 she would send a sign for all the unbelievers. She said she would be sending me messages she wanted delivered to her prayer groups. She asked that the children form prayer groups, even in the schools, and said to even go to the non-Catholics spreading her messages, as they are also her children. She desires each family to form family prayer groups and to pray together, for through prayer and through prayer groups she can do much. She reminds us that we are all her family. She said all of our suffering, all of our disappointments, all of our lives, should be dedicated to her and her Son. She said Satan is very strong at this time, especially with the youth, and the youth (especially of our country) need her help and our help. She is calling all mothers to rally to her aid. She is calling on us as a mother to mothers. She said that, united, mothers can change the world. We mothers especially should all look to her for help, and she will tell each of us, in our hearts, what each of us is to do. She said that many calamities are about to befall the earth, that all that is taking place across the seas will spill over into our land, and that we will need her help to overcome this and deal with it. If we do not listen to her call, many more things will happen. Our Lady also said she desired that the churches be open everywhere so that the people can go in and worship. She said there is no need to close her churches, for God does not want to lock the people out. She said that God wants them to be able to come to Him at any time as this is His house and we are simply its caretakers. We should honor this request and let the doors remain open. She was holding a cross of golden light in each hand and extended them to my friend and me, asking us to accept these crosses (a commitment to her). My friend and I both accepted, and the crosses disappeared. She had so many messages, and I will try to recall each one of them here. She said we must pray hard, for the time is not any longer “short” but is now. The cup of chastisement was now spilling on the earth. She said she needs our help as much as we need hers. She is calling on all mothers everywhere on this Mothers Day to join her in her battle so that she can triumph in her mission here. Without us, she can do nothing. She said the mothers of the world united with her can save mankind. She asks us to bring our children and all children to her, to consecrate the children and all of the youth to her Immaculate Heart and the Sacred Heart of Jesus, for they are especially the targets of Satan at this time. They are weak and need our strength to overcome these temptations. She wants us to form prayer groups and to start them in the schools, to have family prayers and community prayers. This will bring about peace once again. It must be started in each individual, each community, and spread out to join other communities. Only in this way can it be effective and enduring. This will be our sign to her that we are sincere. She asks that we not be bored with her so easily, for she has come to guide us and give us hope, but we refuse to cooperate. She said that if her wishes and messages are not carried out, she will not come again. She advises that we are much like children who receive a new gift which thrills them but which after awhile they discard in pursuit of some other new pleasure. She has come to crush the head of the serpent, which is the evil in all mankind, but she needs our help and our wills, so we must choose. She wishes September 1 to be designated as a day of prayer to Our Lady of Light. She wants the prayer Our Lady of Light to be distributed throughout the United States. She also stated that she will appear at midnight in St. Joseph Church (Kentucky) on September 1 (actually at midnight on August 31) and wished us to be with her then. She said it was her plan that her statue be sent to this church, for she sent it there. It was not an accident of fate, and it was no coincidence. She asked that Fr. Smith of this parish be approached and asked to be her special servant and to aid her in the work she wishes to accomplish here. She said we do not have to convince him of anything, as she will take care of that. He is a very special son to her, and she knows he will respond to her as he has in the past. She said to remind him of “the golden cross,” to tell him that his love for her will be rewarded and that his efforts have not gone unnoticed by her or her Son. She said she has recruited Father Rinfret in the eastern section of America and now calls on Father Smith to accept her invitation here in the middle section. She stated that another priest will be called upon and added from the western section of America, and that these three would be her special ambassadors here in America. She stated that these are her wishes, but she does not insist; she only asks that each one accept of his own free will. I will do as she directed me, for I know now that she will guide and help me. He also imparted to me that we should pray more to our Heavenly Father, not only to Him and His Mother. And also said that these visions here were allowed and sent by the Father as a special grace, as was the gift of His Mother at this time to help all of mankind. I have promised her that I would carry out the wishes she is asking of me. That is why I am writing of it and will share it with whomever she so directs me. This is the resemblance of me that I request be used on my prayer card of Our Lady of Light. However, if this is not possible, then Fr. Smith is to make the final decision. I will honor his choice. I thank all involved in this who are seeking my guidance. Be at peace and remind all that my ways are always of simplicity. I am Our Lady of Light and your mother.